Five inches of knitting at 8 spi doesn’t go very quickly. But I finally got to the Roositud tonight! I’m only a few rows in but I’m really enjoying it. You don’t ever knit with the contrast colors — you’re just weave them in and out. 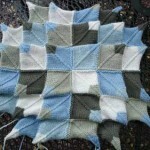 How you deal with the yarn being at the left at the end of the patterned area is really ingenious! 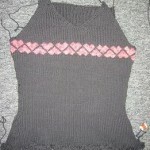 I continue to be wowed by the creative problem solving of knitters of yesteryear. In case you can’t tell, here are the 3 colors of Baby Ull that I’m using. Click on the right pic for a bigger view of the first few rows of Roositud (and disregard the stubble…Paul’s in Seattle this week so I got a little lazy!). I still need to work on the tension a bit but I’m pretty happy with this for my first go at it. 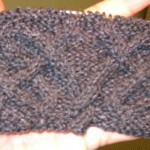 I’ll try to get some step-by-step roositud pics this weekend when I’m knitting during daylight hours. I think I have those Baby Ull colors! I made Liv’s socks with them, quite a long time ago, and they’re gorgeous together. Great minds….. Anyway, I thought I’d laugh with you about the preview of the Winter IK that Jessica (Rose-Kim) linked on her blog. Someone still thinks that knitted ties are cool! After your poll, I had to chuckle. What is this? No scarf update. There are people out here who want/need to know how the scarf is going. The sock looks great – good colors and a great design. Can’t wait for more pictures. Love it! And love Baby Ull! So Cool! Oooh, I love new techniques and ideas! What fun! Thanks for sharing Jody! Those are going to be awesome! They are going to look awesome, can’t wait to see more progress. 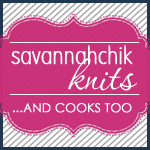 Hi, I know this is not related to the topic at hand, but did you see the preview of the winter interweave projects? There actually is a knitted tie. When I read your little survey I laughed at the silliness of a knitted tie (they had one in a previous issue, you think one pattern would be enough!) but then there is one. so funny. Also, I had to thank you for your natalya gauntlets, I made them and I love them. Thanks so much! hi, I just chanced upon your site and noticed you’re hosting a River KAL! If you’re allowing stragglers, could I please join? Many Thanks! I just saw this technique for the first time last week! How weird is that? I can’t wait to hear about it as you’re knitting on it. And did you see the IK Winter preview? It’s up. The colors are so bright and cheery! Can’t wait to see it evolve. Can’t wait to see the finished socks! Hey! I just noticed – why didnt you use a tubular cast on since youre doing the socks top down? I just tried it for the first time on socks and it’s great!!! I’ve never heard of this technique, your so clever. Its looking great so far, its so pretty. I bet you can’t wait to get them knit up to wear.